The Fellowship was fortunate enough to obtain a copy of A&A: THE ADVENTURES OF ARCHER & ARMSTRONG #12 from Valiant Entertainment. The story is by Rafer Roberts; with art by Mike Norton, colors by Allen Passalaqua (with David Baron & Andrew Dalhouse), and lettering by Dave Sharpe. Epilogue One is by Joe Eisma and Andrew Dalhouse; Epilogue Two is by Marc Laming with Ulises Arreola. Armstrong and Andromeda are trying to restore Archer’s mind to his body and escape with Gub Gub. He is a prisoner of Communist scientists and the 1%’s Austin who are trying to discover the secret of immortality that they think Gub Gub has. Can they restore Armstrong to his old self and escape? I really hate to see this series end, but we know these guys will return. As usual, Rafer Roberts turns in a great script mixed humor and action. It’s very rare that I actually laugh out loud when reading a comic, but I do with this series. Never read the original books back in the day, so I don’t know that their stories were as offbeat and humorous; but this style works with these characters. Mike Norton is the perfect fit for this book. When (and I do mean when) Archer and Armstrong returns, I hope Norton will be along for the ride. Thanks for the fun tales guys. Come back soon. 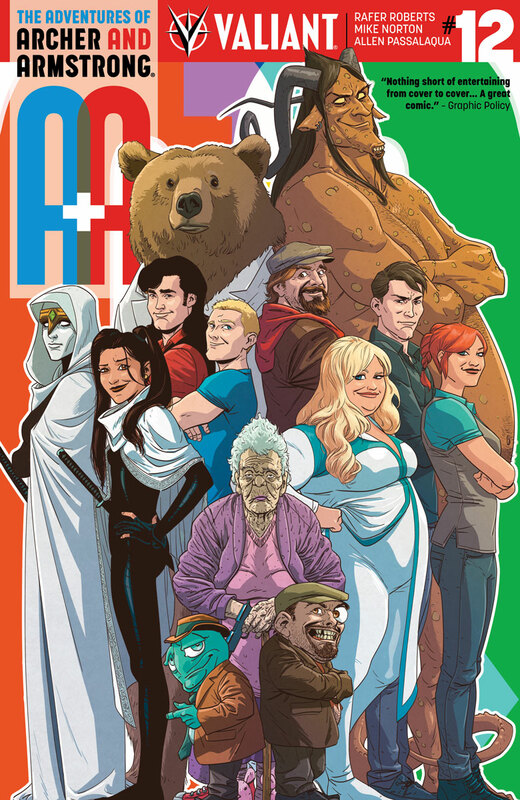 A&A: THE ADVENTURES OF ARCHER & ARMSTRONG #12 is in stores now or available at valiantuniverse.com.